The directly-elected regional Mayors in England met in Bristol today, at the invitation of Tim Bowles, Metro Mayor of the West of England. The Mayors are calling on the Government to strengthen devolution and fully-fund and devolve the Shared Prosperity Fund, which is being set up by the government following the United Kingdom’s exit from the European Union. It follows the Government’s promise to introduce the new funding stream, which replaces the EU Structural Fund, Local Growth Fund and potentially other funding streams, and is worth at least £2.4 billion a year. The Mayors call on the Government to ensure the fund isn’t held in Whitehall, but devolved to regional leaders to further boost devolution and empower Metro Mayors to ensure money is spent on priorities defined by local areas. The call was discussed at the meeting today where the Metro Mayors also pushed the Government to remove unnecessary layers of bureaucracy, moving from decentralisation to full devolution to cut down on red tape. Present at the meeting were Tim Bowles, West of England; Andy Burnham, Greater Manchester; Ben Houchen, Tees Valley; Steve Rotheram, Liverpool City Region; Andy Street, West Midlands, James Palmer, Peterborough and Cambridgeshire & Dan Jarvis, Sheffield City Region. The Mayor of London, Sadiq Khan, wasn’t able to attend the meeting but supports the call from the Mayors. 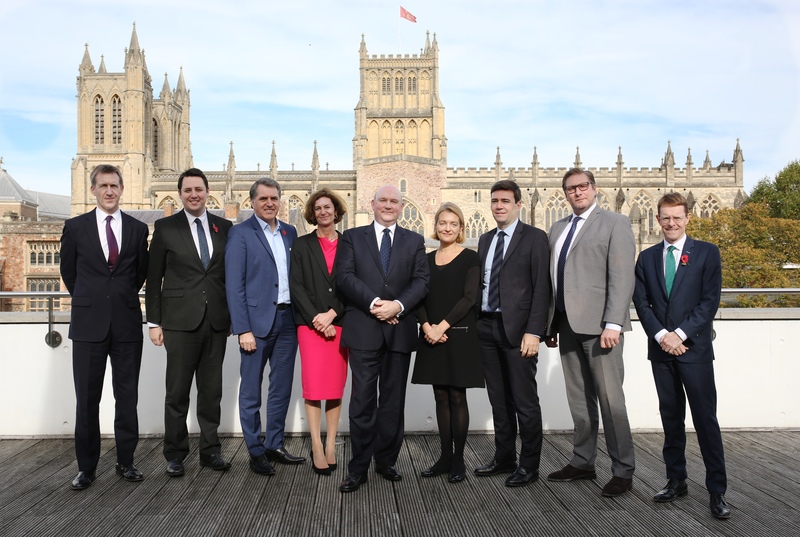 All the Mayors present attended the Global Parliament of Mayors, currently taking place in Bristol and supported by the West of England Combined Authority. Brexit makes it essential that directly-elected regional leaders take back control of funding from central government, ensuring devolution continues to both serve and empower communities. Metro Mayors represent regions which account for nearly 42 per cent of all British growth (GVA) and the role of Mayors leading Combined Authorities provides an opportunity for government to utilise the expertise and leadership already available to grow local economies, embrace the opportunities and address the challenges facing regions. The Government has announced plans to replace current EU cash with a Shared Prosperity Fund worth at least £2.4 billion pounds a year. The cross-party group of Metro Mayors believe this fund should be devolved to regions rather than languish in Whitehall amidst red tape and bureaucracy. The directly-elected regional leaders also call on the Government to move from decentralisation to full devolution as existing funding and reporting structures are fragmented, complex and resource-intensive. The introduction of a streamlined and consistent approach is needed across government departments to fully embrace devolution and maximise the benefits across the country. As the most powerful group of the directly-elected regional leaders, as a unified voice, we call on the Government to grasp these opportunities to re-focus on the devolution agenda and provide regions with the powers and funding needed to ensure economic growth and prosperity. Photo caption: from left to right; Dan Jarvis, Mayor of Sheffield City Region; Ben Houchen, Tees Valley Mayor; Steve Rotheram, Mayor of Liverpool City Region; Patricia Greer, Chief Executive of the West of England Combined Authority and Local Enterprise Partnership; Tim Bowles, West of England Mayor; Sarah Gibson, Head of Government and EU Relations, Greater London Authority; Andy Burnham, Greater Manchester Mayor; James Palmer, Mayor of Peterborough and Cambridgeshire; and Andy Street, West Midlands Mayor.